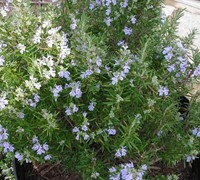 Tuscan Blue Rosemary is a fast growing shrub and herb that can be grown in USDA Plant Hardiness Zones 7A through 10A. It matures to an average height of 5 feet to 5 feet and an average width of 4 feet to 6 feet, depending on climate and other environmental factors. It prefers growing in a location that provides full sun or morning shade with afternoon sun and grows best when planted in sand, loam, clay or silt soil that is well drained. 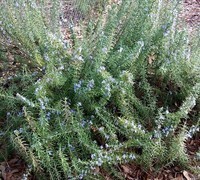 In the spring Tuscan Blue Rosemary produces midnight blue flowers. The foliage is grey / silver and medium green in color. Tuscan Blue Rosemary can be useful in the landscape for topiary and also in herb gardens. Tuscan Blue Rosemary is an evergreen shrub that grows to about 4-6' feet tall and 4-6 feet wide in zones 8 to 10. It is perfect for the southern states as it is more tolerable to heat and humidity. In zones further north it's a good idea to protect plants in winter or plant them in containers and take them inside. Though it sounds like lots of trouble, this rosemary plant is worth the effort! Throughout the year, this Mediterranean native has needle-like leaves, which are very fragrant from afar. In spring, its small violet blue flowers cover the plants and attract butterflies, bees and other beneficial pollinators. Tuscan Blue rosemary has a lemony tang that goes along with its pine flavor and scent. It is not as harsh a taste as most other varieties and partners well with chicken, lamb, and fish. Rosemary is a great culinary herb for the garden, and the broad, bushy 'Tuscan Blue’ has the added appeal of distinctly sea green foliage and violet-blue flowers. In the South, it is classified as a shrub and can be useful ornamentally in foundation plantings and garden beds. Be sure to plant it near decks, patios, porches and other outdoor living areas where the fragrance and the pretty blue flowers can be enjoyed from closer up. It is also at home in coastal areas, rock gardens, hillsides and, like other rosemary plants, is deer and pest resistant. As with all varieties of rosemary, Tuscan Blue performs very well in pots and may be brought indoors for winter use. Rosemary is easy to grow and appreciates well-drained soils and plenty of sun. Constantly soggy or wet soils can be problematic. Water as needed until fully established during its first year and then only occasionaly as needed. If desired, lightly shear for shaping after flowering in spring and apply a general timed release fertilizer at that time. Plant arrived in excellent condition, good price. It's doing very well and is very healthy. Good company that delivers on it's promises.